APIs in Web and mobile applications are the rising trend today. One impact of this trend is that a huge amount of commerce today takes place through APIs. These APIs eventually add to your business value. Well, API performance can directly affect a business, hurting brand image or cutting into revenue as customers struggle to complete their action. What if in your website, pages are taking too long to load. What if your mobile app is taking to long time to load data from server ? How will you know that your APIs are performing slower ? In worst case, It may happen that your server starts taking more and more time and one night at 2:00 a.m - It crashes! Users of the application will be not happy, loss of business to website or application owners..! Surely, It did not happened all of sudden at 2:00 a.m. So, as APIs become more and more important, we are clearly going to need the some information to determine if all the APIs you are using or providing are working properly and how they performing ? That’s why, we as developer, manager or project stack owner, need to have API response time monitoring in place for live project. Doing this enables us to know how much time our APIs are taking to respond back to request. If it starts taking more time, then developers can figure it out and fix it before it leads to worst case. 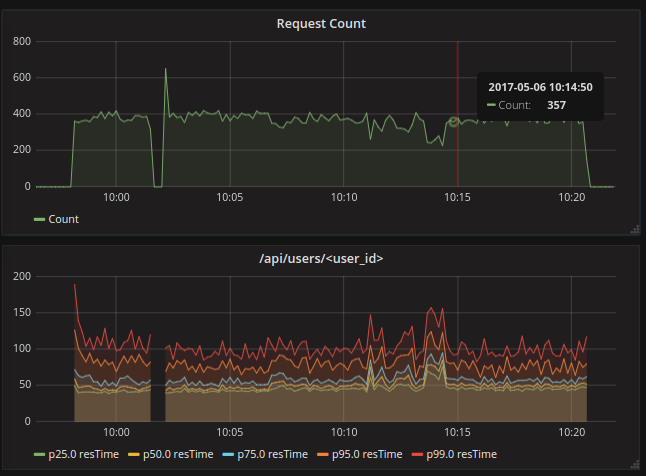 I recently configured a real time API response time monitoring in one of our live projects at Aubergine solutions. In this post, I will be sharing the implementation plan along with configuration of each tool required. In my setup, I have django application running with nginx and uwsgi. I have used uwsgi log file which has following structure for log. Now, let’s have quick introduction to the tools I have used for monitoring setup. We need to setup filebeat on api servers to ship log data to the server which has logstash installed. We will use it to parse each log line and extract necessary information which we can index using elasticsearch. We will use it to store parsed log data. We will use to view and monitor beautiful graphs. Create index on elasticsearch. Index name should be same as you have mentioned in output block in logstash. Change name option. It can be used to filter logs based on their source. Enable output to logstash by removing comment. Replace Ip address with logstash server’s ip-address. Make sure that logstash server is listening to 5044 port from api server. Create logstash.conf file inside /etc/logstash/conf.d/ directory. You can specify source of data in input block of config file. Few options are file,syslog,redis,beats. As we have mentioned earlier, that we are going to use filebeat to ship logs from application server to logstash server. So we need to configure beat as an input option in config file. Make sure your server (which is running logstash) is accepting TCP connection on port 5044. If you are not using filebeat for log shipping then you can directly use log file as an input option. In this case, you need to install logstash on your application server itself. We are going to parse logs generated by uwsgi. We will use grok to do it. Below is the sample log line for uwsgi logs. We need to write following code in filter block in order to parse above line. # elastic search aggregations, we need to convert data types. # It will help us filter data for this particular API endpoint. # similarly, we can add other API endpoint also. In the output section, you can specify where to send processed log data. That output option could be elasticsearch, file, graphite and statsd. You can replace localhost with any other IP on which your elasticsearch is running and listening on port 9200. Replace index name with your index in which you want to store log data. After all configuration is done, you can proceed with starting all of them one by one. Now, make some API calls to your api server and check if they are being parsed successfully and they are stored in elastic-search index. If grafana is installed successfully (steps written above), do start grafana server by following command. It will show you grafana UI with sign up option. Register your self. After registration follow steps as per Grafana UI. You will be asked to create Organisation first. Edit Graph to display the result as you want. 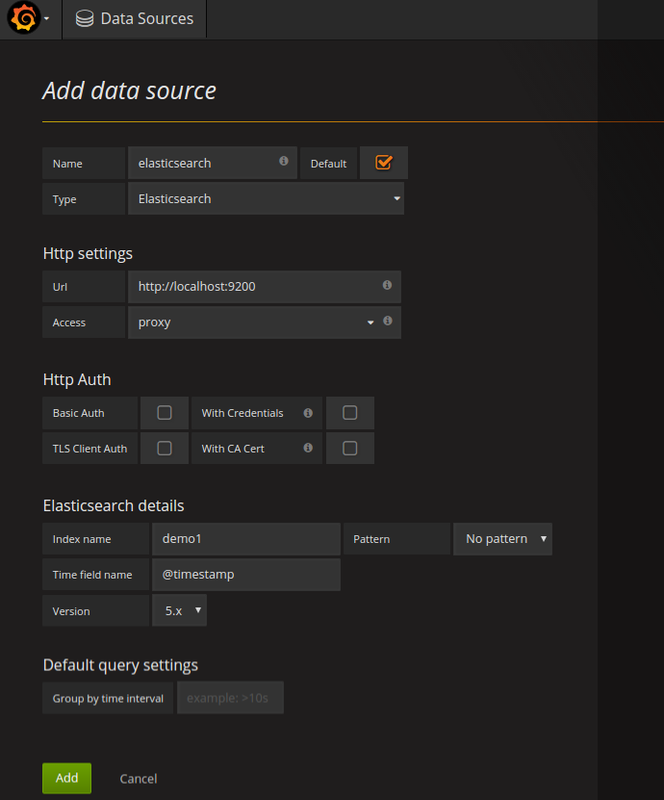 Under the metrics tab, enter query which you want to give in order to filer data from elasticsearch. Note: This filter will only work if we have added this extra key “API” during logstash filter process. It will filter out all the log entried related to this particular API end point. There are many other config/options for graph panel. You can explore it. After saving this two graphs you will have something similar to below dashboard. That’s It. This is how I have configured API response time monitoring.